With Power BI gateways, you can keep your data fresh by connecting to on-premises data sources. The gateways provide the flexibility you need to meet individual needs, and the needs of your organization. In addition to the personal gateway, which is already available, we’re happy to announce the preview of the Power BI Gateway for enterprise deployments, which enables centralized and IT-managed access to on-premises data sources for organizations/ departments. Get started and download the enterprise gateway. BI/IT administrators can configure one or more enterprise gateways for their team/ organization. They can also add additional administrators to help manage the gateways. Gateway administrators can add data sources to the gateway by providing credentials (read the FAQ below to understand how these credentials are encrypted and used). The gateway administrators also control which users can access the data source from Power BI using this gateway. In this version of enterprise gateway, live connections to on-premises SQL Server databases using DirectQuery are supported. This means that you can view the latest data from Power BI without the need to schedule a refresh. With live connections, there is no limit on the size of the model as data is not stored in the model. Live connectivity to SQL Server Analysis Services models (tabular and multi-dimensional) is planned to be supported with the enterprise gateway, within the next few weeks. 1. 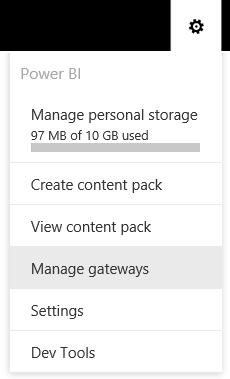 Install ‘Power BI Gateway – Enterprise (Preview)’: Download the gateway and install it on a computer with connectivity to the data source. Learn more about the Power BI gateways.2. Once the gateway is installed, you can manage it from ‘Manage gateways’ (on the top right) in Power BI portal. 3. Select the gateway you just installed and add your SQL Server DB as a data source. You can define who can access this data source using this gateway in the ‘Users’ tab. 4. Using Power BI Desktop, you can create a report in DirectQuery mode that connects to this data source.5. Publish the report to Power BI. The report will be configured automatically to use the gateway as long as the user publishing the report is part of the access control list for the data source defined in step 3 above.6. Now you are good to go. You can pin tiles to dashboard and share dashboards with other users. As it is a live connection, you can always view latest data without the need to set up a scheduled refresh. Here are the links to documentation and troubleshooting guide for additional information. – What about the Power BI Personal Gateway? How is this different? Personal gateway is intended to be used directly by anyone creating a Power BI report that requires access to on-premises data sources. As it is intended for personal use, it doesn’t support multiple users, centralized management and access control capabilities. Enterprise gateway is used by organizations to serve a large number of users. Administrators can set up access control for individual data sources and monitor usage. Learn more about the two gateways. – What about Analysis Services connector? Power BI Analysis Services Connector allows you to connect, and issue live queries, to an Analysis Services Tabular server for use with Power BI dashboards and reports. As noted above, we will be adding this capability to the enterprise gateway in the coming weeks and will support multi-dimensional models in addition to tabular models. As the enterprise gateway includes capabilities of the AS connector, users can upgrade to the enterprise gateway. Please watch out for upgrade guidance, which will be available in the coming weeks when the capability is supported in the gateway. – What credentials are used to connect to on-premises SQL Server DB using the enterprise gateway? Gateway administrators can add data sources by providing credentials. All queries to the data source will run using this set of credentials. Credentials are encrypted securely (using asymmetric encryption so that they cannot be decrypted in the cloud) before they are stored in the cloud. Credentials are sent to the machine, running the gateway, on-premises where they are decrypted when the data sources are accessed.